It's a known fact that LED lighting makes computer parts run faster, right? Right!? Okay maybe not—but that hasn't stopped memory makers from loading their RAM to the gills with flashy LEDs. With cases, motherboards, and every accessory under the sun now representing the rainbow, maybe they didn't want to feel left out. The latest memory maker to RGB-ify its sticks is G.Skill with its new high performance Trident Z RGB series. 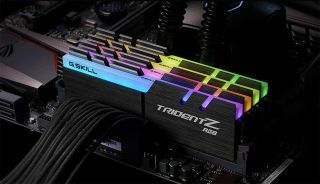 Geil beat G.Skill to the punch here by putting RGB lighting on its Evo X RAM, but unlike those modules, G.Skill's Trident Z memory does not require any additional power connections. Instead, the modules draw the necessary power from the DIMM slots to light up each stick's uncovered full-length light bar. The default setting for these Trident Z sticks is to display a rainbow of colors in a wave effect. However, G.Skill is working on a software utility that will let users customize the color options and light patterns. G.Skill says the utility will be available in February of next year. Fancy lighting aside, the Trident Z family is G.Skill's flagship RAM featuring a custom 10-layer PCB and hand picked ICs for better overclocking performance. The Trident Z RGB series is no exception—G.Skill claims these newest modules will be capable of reaching speeds of up to DDR4-4266MHz. "Trident Z RGB series memory kits are rigorously tested under proprietary G.Skill test methods for reliability and compatibility to ensure the highest possible quality. And like all other G.Skill memory, the Trident Z RGB is covered under a limited lifetime warranty, as well as full support for XMP 2.0 for easy overclocking and simple BIOS setup," G.Skill adds. The Trident Z RGB series will be available around the middle of January. Pricing information is not available at this time, but the non-RGB Tridents can give you a baseline to guess from.